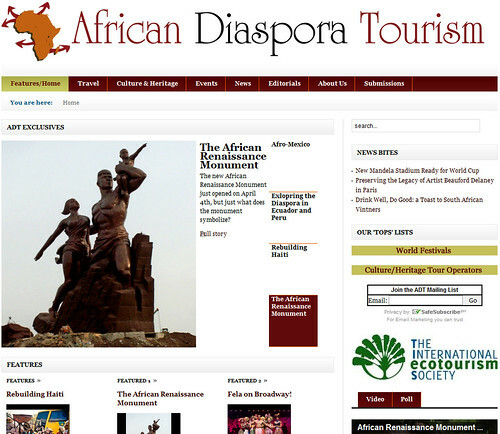 If you haven't already stumbled upon it, you should definitely stop by AfricanDiasporaTourism.com. "African Diaspora Tourism (ADT) is an online magazine dedicated to exploring the culture, heritage and influences of people of African descent, past and present. The ADT web site will highlight information on how people of color, living all over the world as a result of the transatlantic slave trade and modern-day migration, are continuously shaping the cultures of North, Central and South America, the Caribbean, Europe, as well as Africa. ADTs major objective is to enlighten and inspire cultural and heritage tourism through up-to-date information, compelling first-person travel articles, candid images, and scholarly research. In addition to bringing you a first-rate travel journal about the people and places of the global African Diaspora, ADT is committed to supporting sustainable tourism and preserving the culture and heritage in the places we explore." ADT also encourages submissions from writers. 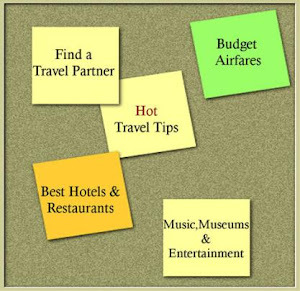 My name is Ehav Ever, and my former blog Hochmah and Musar is listed in your Blogs by Black Travelers. Your blog is very interesting, good job! I am a new blogger and because of my love for Santorini (a Greek island) I started my blog, Santorini Greece. Check it out.